Rye Brook, New York is home to the William E. Ward House, the oldest reinforced structure in the United States. When the house — made up entirely of concrete, aside from wooden paneling, doors, and window frames — was first built in the 1870s, neighbors were skeptical of the new building material and nicknamed the house “Ward’s Folly”. 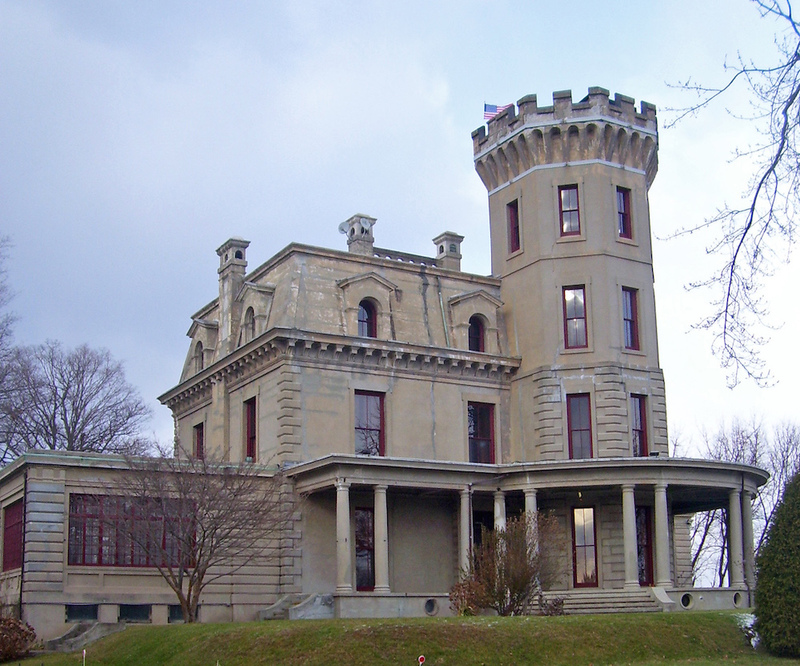 But, after recognizing the strength and durability of the reinforced concrete, the house’s nickname changed to “Ward’s Castle”. The house, shown below, is an early testament to the strength of reinforced concrete and its effectiveness as a building material. The William E. Ward House. Image by Daniel Case — Own work. Licensed under CC BY-SA 3.0, via Wikimedia Commons. In modern construction, reinforced concrete is often used in the development of foundations, frames, walls, and beams. 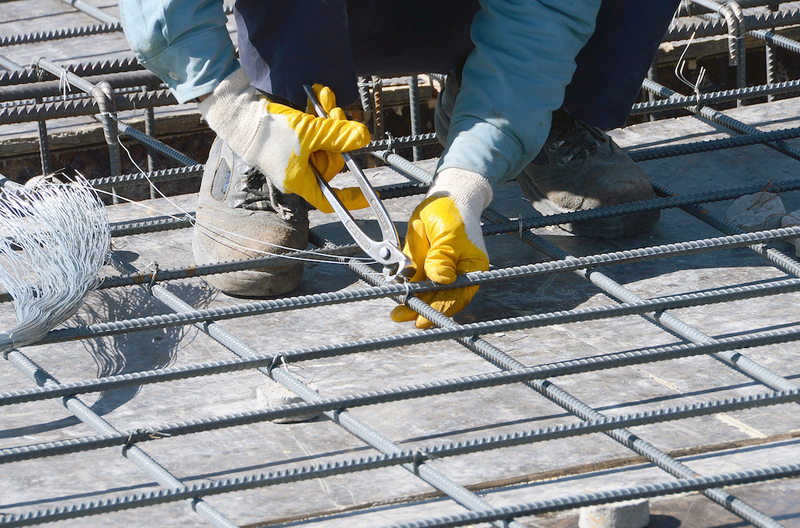 Typically, the material consists of rebars (steel bars or steel meshes) that are embedded in the concrete. The rebars are meant to avoid stress within the concrete that could potentially lead to cracking or failure of the structure. Because the concrete shows weakness in tension, it is often prestressed in compression by pretensioning the rebars. Ensuring the functionality of each reinforced concrete design is, of course, an important step in the building process. A construction worker creating a rebar for reinforced concrete. Physical prototypes are one way to test reinforced concrete, but such an approach can be both expensive and time consuming. Think back to the Ward House, for instance. In that situation, deflection tests were performed over multiple years and the strength of the floor had to be tested after the construction of the house. Today, you can use simulation to quickly analyze multiple reinforced concrete designs without the need for physical prototypes. Apps take this power to the next level, allowing you to share simulation capabilities with your colleagues and customers through an intuitive and easy-to-use interface. 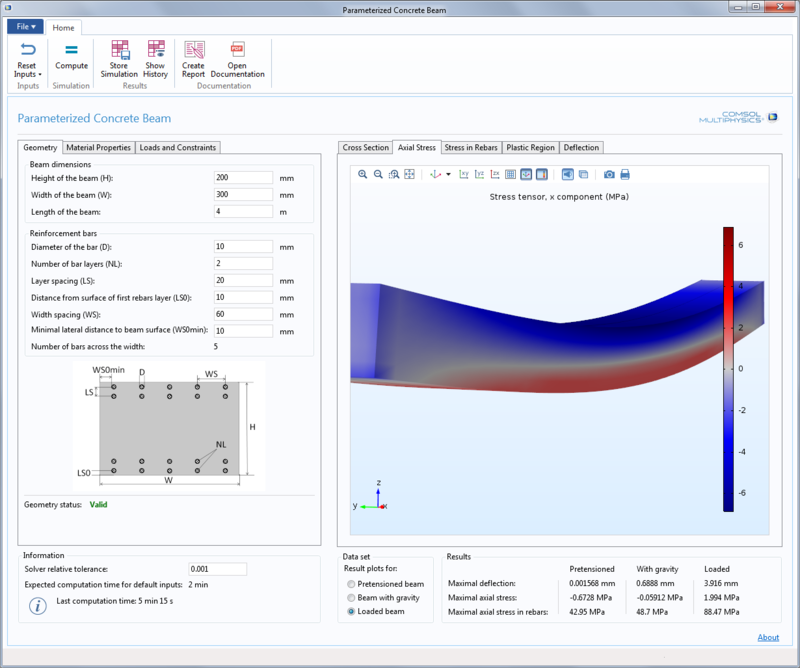 As an example, let’s take a look at the Parameterized Concrete Beam demo app, which is available in our Application Gallery. The Parameterized Concrete Beam demo app is based on a model of a concrete beam that is reinforced by steel bars. The focus of the app is to compute the deflection and axial stress of the beam, with a body load as the self weight and a surface load on the beam’s top face. Within the app, users have the option to modify a range of parameters. Such parameters include the geometry of the beam, steel and concrete material properties, the distribution of the reinforcement bars, and boundary conditions at the beam’s end. In regards to the app’s layout, the user inputs are primarily placed on the left side, with the results and plots on the right side. When designing your own app, you have control over the parameters that are available for modification as well as how they are presented in the app’s user interface. This not only makes it easier for users to navigate the app, but it also helps to ensure accuracy in the simulation results. Going back to our demo app, let’s take a look at the input sections. These sections are tabbed under three panels: Geometry, Material Properties, and Loads and Constraints. Within the Geometry panel, you can alter the beam geometry as well as the distribution of the reinforcement bars. Once the inputs are modified, a new cross section is plotted in the results panel (shown below), enabling users to visualize the updated beam design in a simplified format. Additionally, the modified geometry is checked to make sure that the rebars are consistently located within the concrete beam geometry and don’t interfere with one another’s geometry. If such a situation does occur, a warning message will pop up in the geometry check area. 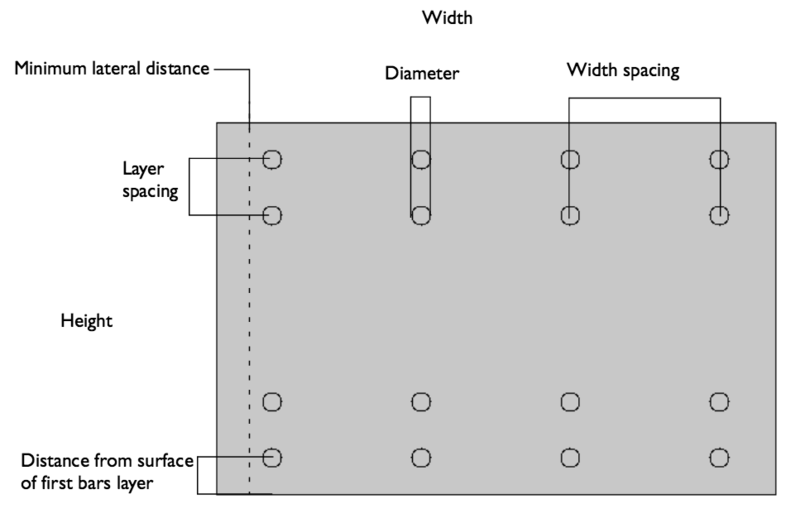 Schematic of the beam cross section, showing the main geometrical parameters. The Materials Properties panel features the material properties that can be modified for the steel and concrete used within the reinforcement bars. In the Loads and Constraints panel, there are four sets of boundary conditions to choose from for the ends of the beam. You may also set the applied loads, pretension of the rebars, and choose whether gravity should be taken into account in the simulation. In the Results and Plots section, you can choose at which step the results are displayed: after the pretension of the rebars, after gravity is applied, or after loads are applied. The default plot is the axial stress in concrete, with tensile stress plotted in red and compressive stress in blue. You can also plot the stress in the rebars, the plastic regions, and the deflection of the beam. The numerical values of those quantities are displayed for the three steps in the table below the plots. 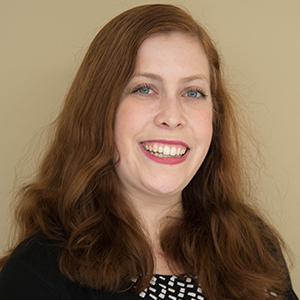 Apps create a smoother design process by empowering people of varying levels of expertise to run their own simulation tests. In the case of a reinforced concrete beam, building an app provides an easier route for testing and analyzing different design schemes. This helps to ensure the optimal safety and performance of the beams and thus the structure in which they are used. The app presented here is just one example of what you can design with the Application Builder. We hope that it both inspires and guides you in your own app-building process.